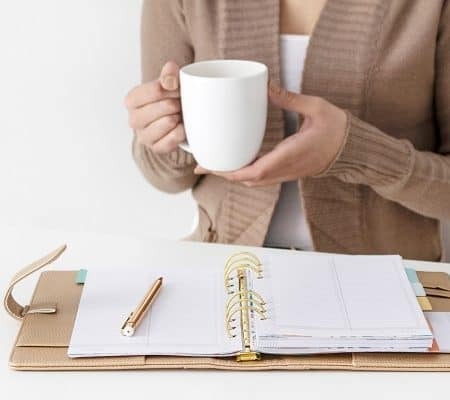 Every successful blogger out there will tell you that to be successful you need an email list.Our number one focus for you, is to help you start gaining loyal and engaging subscribers for your online business. Loyal and engaging subscribers are those that will read and share your blog, purchase your products and engage with you on Facebook. 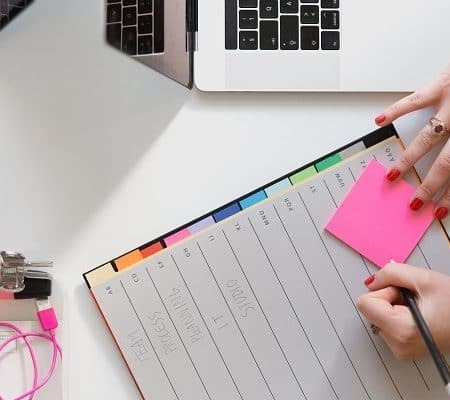 The question is how to effectively grow your email list fast so you can start monetizing your online business right away? If you are just starting out on your new blog and you have no email list, then stay tuned. We will show you the step by step strategy on how to effectively grow your email list fast. Getting 5 subscribers a day is cool, but let’s see if we can try to get you 25 subscribers a day. This will work only if you make your list building campaign your priority. Remember having a pretty website that does not convert will do nothing for you. 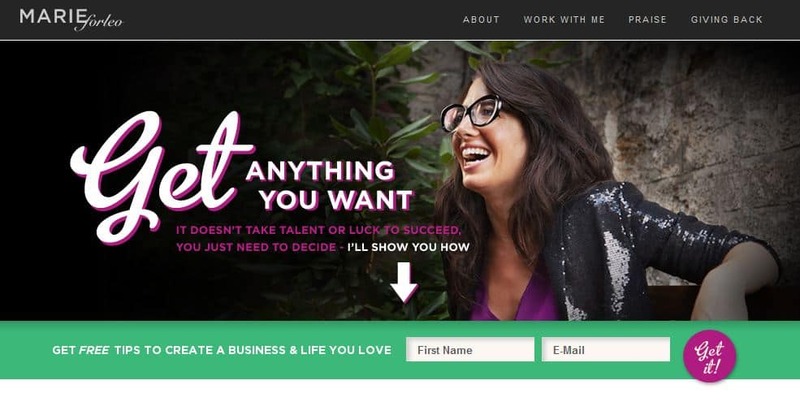 You want a website that will male it easy to grow your email list. This opt in page from Marie Forleo is totally amazing. It makes you want to sign up for her offers. It is guaranteed to almost double your conversation rate and sign-ups almost instantly. They are so many plugins like Hello Bar and SumoMe that offers this type of feature. Go ahead and create an opt in page similar to this and see your list grow almost instantly. This is the best way to increase your sign ups and get more emails for your online business. Only have one opt in form on your side bar? 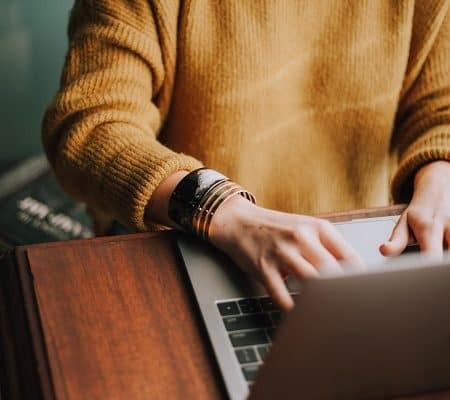 Girl, it’s time to add fuel to your blog. Aim at having between 4 to 5 different opt-ins around your blog. Not sure where to add your opt-in forms? 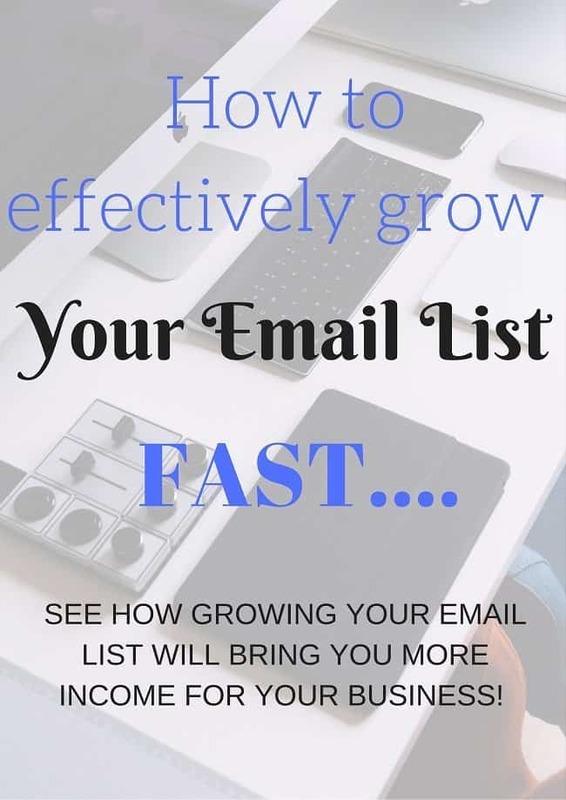 Not sure how to effectively grow your email list fast? See where you can add additional opt-in forms on your website to increase conversion. How about within your posts? Not sure how to create these opt-ins? Try using Leadpages. Under leadpages there is a section for leadboxes. 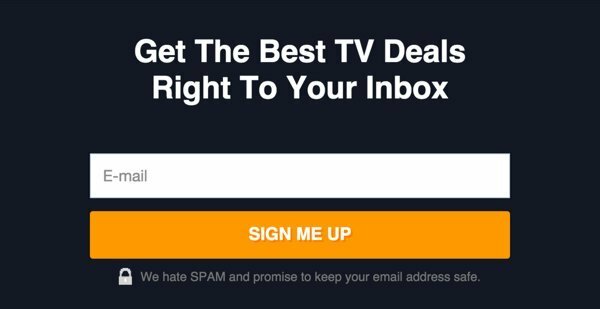 Some other email platforms that have amazing opt-ins are ConvertKit and OptinMonster! My go to is definitely Leadpages it has easily tripled my sign up rates on my previous blogs. I will continue to use them. See an example of a lead box option below. This has to be a no brainer option that you readers will just want. The best way to know exactly what your readers want it to ask them. Where do your readers hang out? Facebook, Twitter or Instagram? Go ahead and create a poll and ask them what they need. Then create a FREEBIE with the information gathered. What FREEBIE will you be creating? I find that Worksheets and email courses work well. Social media is the best way to promote your work. Use this to your advantage while you can. On Instagram, you can add an image prompting your new incentive offer. Direct your followers to your bio to hit on the link. Ensure your bio is referencing your incentive. Update your link as well in the website section. All your social media website section should be updated with the link to your FREEBIE. If you want to take it a step further, you can use Facebook ads to promote your FREE incentive by using targeted keywords. 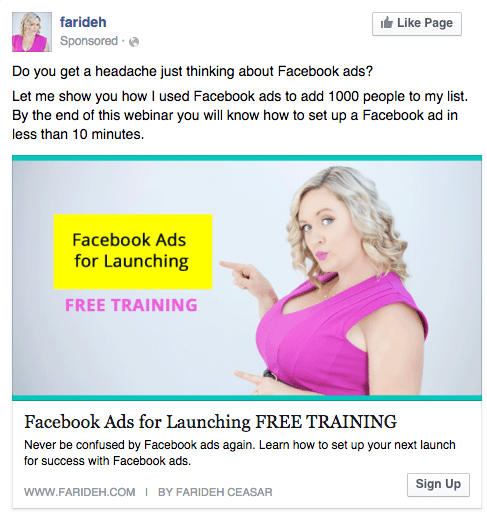 Farideh Ceasar has an amazing course about promoting and growing your list using Facebook! 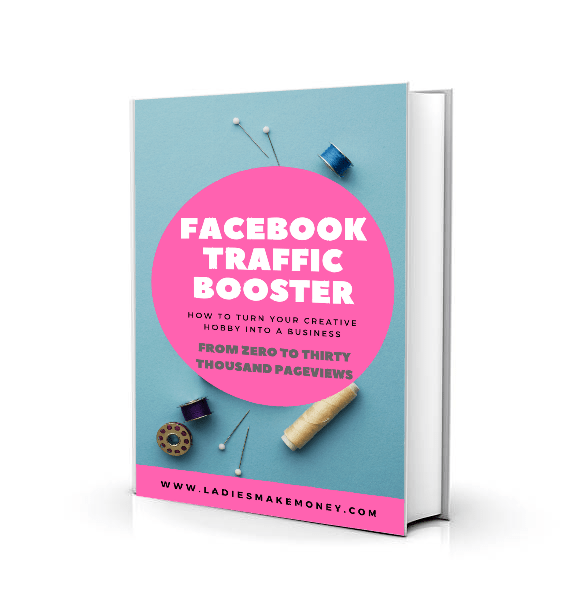 Farideh Ceasar does an amazing job explaining how to effectively grow your email list fast using Facebook Ads. Definitely check her out! Facebook groups are also an amazing way to promote your FREE incentive. Groups have promo days where you can promote your incentive. If you share one of your incentive in every Facebook group for a couple of weeks, you can easily get up t0 a 100 sign ups per week. So go ahead and join a few Facebook groups that your potential clients may be hanging out in. Don’t forget Twitter and Pinterest! They are your best bet for increasing your sign up rates! The more content you create, the more traffic you get and the more email subscribers you will get. This will equal to making more money. A content upgrade is when you offer your readers added value on top of the blog you just wrote. 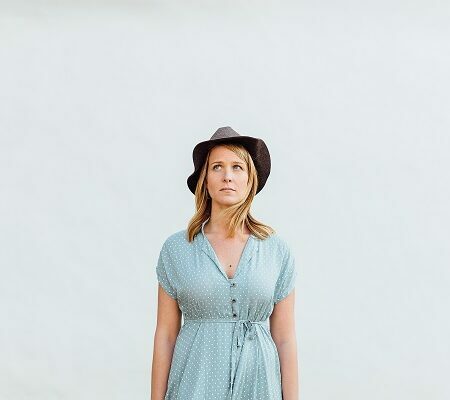 For example, you might have blogged about the best way to budget your monthly income. Your content upgrade would be to offer a FREE budget template for download. You added value to your post and your readers will most likely download this! Easy! You need to send your subscribers unique and valuable information preferably on a weekly basis. The information you send out has to be of high quality. Continue sending them awesome content including more FREEBIES, announcing your new blog posts and your products. Be consistent as these subscribers are your loyal fans and they will become future buyers. This is how to effectively grow your email list fast. It has helped us a lot and we are looking forward to you implementing these strategies. What strategies have you used that has helped you grow your list? Tell us in the comments below! If you enjoyed our blog on “How to effectively grow your email list fast” we would like to have you join our email list and receive weekly money-making tips, you can join now! And we would love to have you on our Private Facebook page. I need to work on my email list but if I can be honest, it is extremely frustrating for me to receive an opt-in pop up as soon as I go to a site. I like to look around first. I like the option around the fold the best. Thank you for the lovely comment.You definitely need to do what works best for your readers. You need to give options, if someone does not like the opt-in as soon as they get on, they have the choice to cancel. Whereas 75% of the people love this as long as it is something great. That is the beauty of finding out what works for your blog and going with the majority. I would love to do what I like best, but if they majority is not liking it and I am losing opportunities, then I want to do what’s best for the readers and what’s best for the dollars (some email marketing platform require you pay a monthly fee, you want to do the best you can. This is great! I have been working on this! 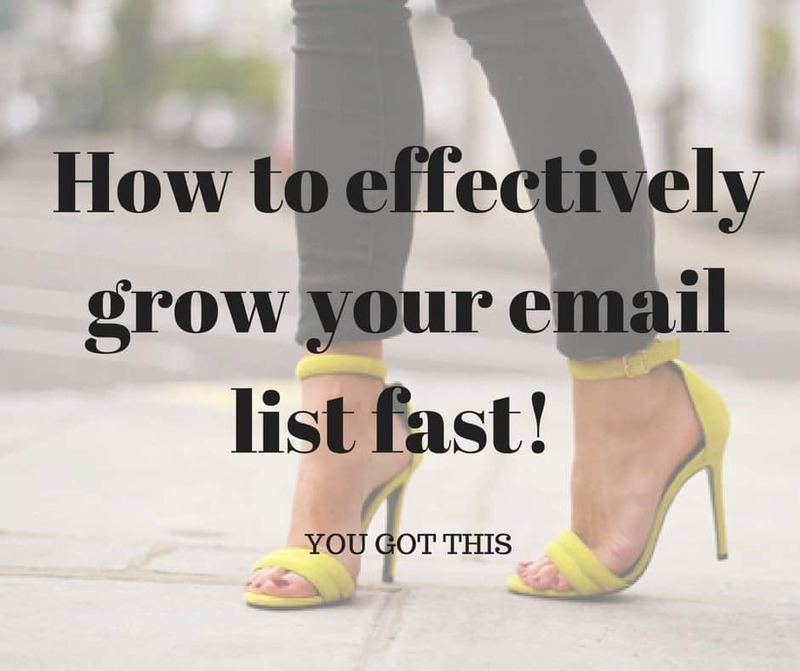 great tips, i’ve been trying to grow my email list and it’s so hard! Having a great opt-in and placing it in several places on your blog will help. These are great tips. Offering an incentive is an idea I’ve been pondering on. So awesome! My email list is pretty small. I’ve been thinking of ways to grow it so this was very helpful! Wonderful tip! I need to work on growing my e-mail list! This such a great list of strategies and resources. Thanks, I’ll get right to it. Hi ! Thanks for the great tips! I did have a question. What is the difference between an email list (say with Sumo Me which is what I use) and a subscription list (say automatically set up through wordpress)? How should I treat these differently? There is no difference. You are just using different platforms to attract clients to your list. For example: You could use SumoMe as a lead magnet to a free e book and subscription on your blog to tell people about free ways to make money. One may convert better than the other. Thank you for the strategies. I really need to grow my email list. I only have the sign up form on the sidebar but i think I have a couple more ideas after reading this post. Yes, have a few more areas for your email list and promote the hell out of it! Good luck!! You are welcome Kitty :)! Great tips. Thanks for sharing these! I’m always trying to grow my email list, so posts like these are very helpful. 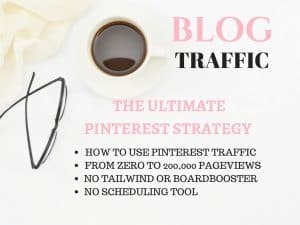 You will find that your list will make your blog life so much easier! Incredible tips! Given me a lot of ideas. Thanks for sharing ???? Love this list of strategies. I am trying to grow my list, it seems like it’s moving at a snail’s pace, but I know I have to put much more work into it for it to grow steadily. That’s right Amanda! Thank you so much for stopping by. Let us know of your progress!